Designed for private sector and military leaders responsible for the life cycle aspects of a system – from acquisition to its end of life. Participants work with leading experts in the research and education fields to develop a deeper understanding of life cycle theories, practices, and techniques. 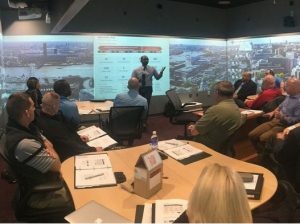 The Life Cycle Executive Leadership Program was designed to increase participants’ knowledge, skills, and abilities while linking them to a broader network of industry peers. It reinforces practical “working” strategies, expanding and facilitating knowledge transfer and cooperation within and among participating organizations and provides world-class academic instruction, peer interaction, and in-depth exchanges with military and private sector counterparts. Prior to the program, each participant submits a problem statement outlining a life cycle management challenge that they face in their job. These statements are distilled into five to seven common topics, which are assigned to working groups comprised of participants with similar challenges. The groups meet during the week to explore solutions, exchange ideas, and apply lessons learned from the day’s sessions. On the final day participants brief a professor and a senior military and/or private sector leader on their proposed solutions. Professionals responsible for developing or implementing a life cycle approach to acquisition, design, or sustainment. Ideal participants include: O-4 to O-6 grade military officers, GS-13 to GS-15 government civilians, and their private sector equivalents with 10-15 years of management experience. LCELP is offered in partnership with the Department of Industrial and Systems Engineering at North Carolina State University (NCSU) and North Carolina Agricultural and Technical State University (NC A&T). With its business education expertise, IDB has worked with experts from these universities to develop a specialized curriculum on effective and affordable life cycle system design focus on total cost reduction. LCELP residencies begin Sunday evening with an opening dinner reception and conclude by 1:00 p.m. Friday afternoon. Classes during the week typically begin at 8:00 am and conclude by 4:00 pm to provide groups time to study before dinner, and there are several evening events. Residencies are typically held in the University of North Carolina at Chapel Hill’s Friday Conference Center with lodging at the Courtyard Chapel Hill. In 1991, the Friday Conference Center opened to primarily serve the conferencing needs of the University. The 25,000 square foot facility includes 23 meeting spaces, ergonomically designed seating, and audiovisual systems designed to support the needs of adult learners. Meeting spaces include a seminar room, large and small meeting rooms with flexible seating, a smart classroom with 25 direct fiber-optic connections, a 416-seat dining room, flexible space lounges, and breakout rooms.